At what point do we no longer call Chris Harris Jr. an underdog? When does the Broncos cornerback shed the underrated label? Should it have been simply when he made the Broncos roster in 2011? This was a kid who received just one Division-I scholarship offer coming out of high school and went undrafted out of Kansas. He got the last spot on the training camp roster, then not only made the team, but played in every game and was named to the All-Rookie team. He beat some immeasurable odds just to make it that far. Or should it have been when he picked off Philip Rivers twice on a Monday night in 2012? Or later that year when he pick-sixed Joe Flacco, posting the longest regular-season interception return in Broncos history (98 yards)? Or after he started the season’s final 12 games? Or became entrenched as a starter for all of 2013? He’s now getting days off during training camp, the special breaks designated only for established veterans. Moments after the morning practice concluded on the fourth day of camp, Harris took a seat on a bench just off the practice fields at the Dove Valley training complex. All but eight players were in pads; Harris was among those without. Nary a drop of sweat existed on his forehead, while dozens of teammates peeled off drenched undershirts. All the vets who got the day off also happened to be Pro Bowlers – an “I’ve made it” moment if ever there was one. Chris, you’re a full-time starter, signed a $42 million contract last year and you’re a Pro Bowler. Do you still feel like an underdog? Pro Football Focus ranked you as the best cornerback in the league. You still feel like an underdog? Okay, in your mind, what has to happen for you to no longer feel like you’re an underdog? The problem is, Harris’ journey is such a classic underdog tale, he’ll never completely erase the perception. 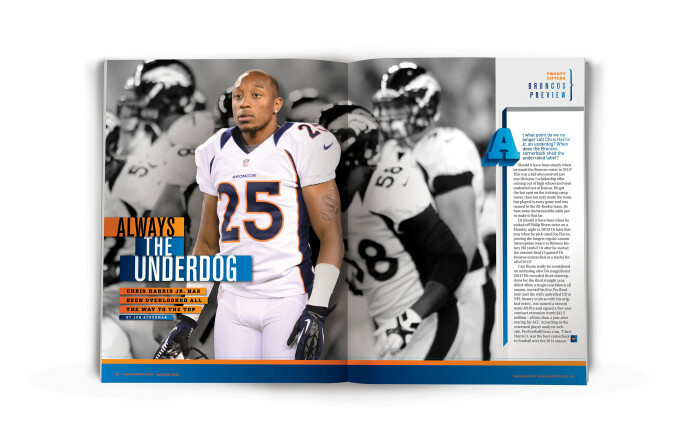 Especially not when the Chris Harris Jr. Foundation runs a summer camp called the “Underdog Football Skills Academy.” Across the back of each shirt handed out to the kids this summer reads, “Underdog.” It’s a part of who Harris is. He may not want to be an underdog, but that’s what drove him to become a top dog. Therein lies the beauty of Harris the person. All the times he’s been slighted, overlooked, and counted out, all the times he’s tried to prove his worth or earn some recognition, that can leave a man mad at the world. Angry, bitter or hateful. Harris is not mad at the world. Far from it. He boasts one of the biggest smiles in the Broncos locker room. He’s a favorite among the media, evidenced by his 2013 Darrent Williams Good Guy Award, which annually goes to a Bronco displaying enthusiasm, cooperation and honesty in dealing with members of the press. And he’s popular in the community. In June, he accepted the Henry P. Iba Citizen Athlete Award from the Rotary Club of Tulsa (near his hometown of Bixby, Okla.), an honor that recognizes premier athletes who have excelled in their sport and shown with their actions a desire to help others. The latest dis comes from the NFL Network – well, actually his fellow NFL players, whose votes make up the network’s annual Top 100 Players list. Harris was left off. 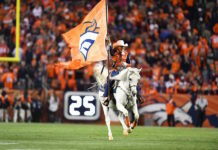 The six Broncos who did make the cut – Peyton Manning, Demaryius Thomas, Von Miller, Julius Thomas, DeMarcus Ware and Emmanuel Sanders – were all taken among the first four rounds of their drafts. The Broncos have a long history of producing productive undrafted players, the all-time best being receiver Rod Smith, who signed in Denver after going overlooked in the 1994 NFL Draft. Upon retiring 14 years later, Smith had racked up more receiving yards (11,389) and touchdown receptions (68) than any other undrafted player in NFL history; held franchise records for career receptions (849), receiving yards and touchdowns; played in three Pro Bowls; was a two-time All-Pro; and won two Super Bowls. Should another undrafted rookie make the 53-man roster this year, it would run the Broncos’ streak to 12 seasons. Among those players still on the squad are Harris, running back C.J. Anderson (who also earned his first Pro Bowl trip last year after not getting drafted in 2013), and linebacker Steven Johnson, a teammate of Harris’ at KU. Seeing Harris thrive with the Broncos influenced Johnson to follow him in 2012. Broncos coaches probed Harris for insight on his fellow Jayhawk defender. Always known as an intelligent player, Harris had the Broncos’ trust and he was happy to put in a good word. They handed Johnson a $12,000 signing bonus, six times the meager $2,000 Harris received a year prior. Money well spent, though, as Johnson started seven games last season and is pushing for a top inside linebacker gig in ‘15. Johnson sees Harris as a role model, someone to look to in how he carries himself. If Harris can make the NFL out of KU, Johnson thought, so can he. If Harris can become a starter on defense, so can he. If Harris can get into the Pro Bowl and become a multimillionaire, so can he. Harris’ football journey is well chronicled. Just one D-I scholarship offer came his way despite all-state honors at Bixby (Okla.) High School, and it came courtesy of KU, a program that had never sniffed a BCS bowl game prior to Harris’ arrival. He starred and started four years in Lawrence, but every NFL team passed on him – the fate of most Jayhawk football players – in the 2011 draft. 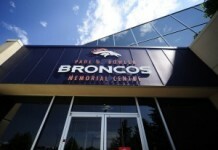 After the NFL lockout, Denver signed Harris as an undrafted free agent, but only because training camp rosters had expanded from 80 to 90 with the new collective bargaining agreement. The 90th spot and smallest signing bonus went to Harris. By the time camp concluded and the squad needed to be whittled to 53, he had impressed enough on defense and special teams to persuade coaches to keep him over one of their draft picks the year prior, Perrish Cox, who was battling legal problems and weight issues. 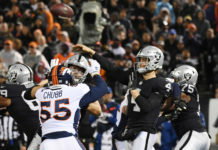 Harris appeared in all 18 games that season (including the playoffs), even started five of them, led all Broncos cornerbacks in tackles (65) and was named to the NFL All-Rookie Team by the Pro Football Writers of America. Yet, few people are privy to the love story that coincided with Harris’ ascension into the NFL. Chris met Leah Brown at a young adults Bible study as a college freshman. She was a sophomore, but so incredibly shy that he never even heard her voice until she was a senior. Standing next to each other in line for a fashion show at their church, Chris asked her about her major. Hers is the voice Chris hears most often because she’s now Mrs. Leah Harris. A simple message on Facebook after they left KU led to them exchanging phone numbers, digits they would soon know by heart after dialing them daily. Chris’ future was uncertain due to the lockout, so he trained and interned at a law firm in Oklahoma. Meanwhile, Leah began a career as a project manager for Huhtamaki, a packaging manufacturer. When they weren’t working, they were on the phone. Team officials had no idea Chris’ friend (they weren’t officially an item just yet) was listening in, not that it mattered. Leah contained her excitement and could hear the happiness in Chris’ voice upon receiving that life-changing invitation to camp. Little did she know she was witnessing the beginning of a classic NFL underdog story, or that she’d be a main character in how it played out. The lengthy long-distance chats continued while both embarked on their careers, often covering serious details. Such as, what was Chris’ backup plan if he didn’t make it in the NFL? After some hard work and many prayers, Plan A turned out just fine. As Chris’ time on the field increased, so did the rookie’s fondness for Leah. Two months after Denver’s season ended with a playoff blowout in New England, he proposed. By the end of June, weeks before the start of his second training camp, they were married. Leah quit her job in Kansas and moved out to Denver to be a “pusher” – pushing, supporting, encouraging and praying for Chris, important tasks she believes she wouldn’t have been able to do if she were working. However, ask Leah if fatherhood has changed Chris and the response differs. As any new father can attest, you’re far from the most important person in the family when a baby arrives. Much of the attention, many of the conversations, and most of the money is spent on the child. The dad sort of gets overlooked. Chris Harris Jr.’s football life has prepared him well for this life. Fatherhood is new. Getting overlooked, however, is something that he’s more than used to. In fact, in a circuitous kind of way, perhaps football has prepared him best for fatherhood. If his football career is any indicator, it’s safe to assume that Chris Harris Jr. the All-Pro cornerback will naturally and seamlessly become an all-pro father. Emerging from that overlooked underdog role, after all, is what he’s always done.